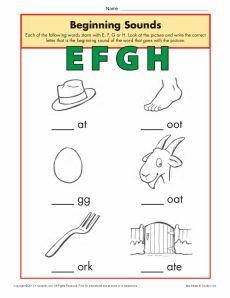 Help your young reader practice the primary sounds of the letters E, F, G and H with this worksheet. She’ll finish the word that matches the fun picture by adding the first letter. The worksheet follows the Common Core Standards for Phonological Awareness for first grade and Phonics and Word Recognition for kindergarten but may also be helpful for other grades.